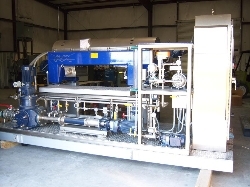 Clearwater Separation Systems, Inc provides polymer blending systems (dry and liquid emulsions), injection manifolds, chemical/product pumps and tank mixing systems. Most systems are built utilizing the Norchem AnCat � emulsion polymer blender, providing maximum mechanical polymer blending. Hydration tanks and solution pumps are also available if required. Clearwater also provides industry and the military with a high flow dry polymer systems for various applications. These systems provide instantaneous control of the % solution and flow within various feed circuits. P.O. Box 1950 / 611 Eastgate Rd.